Welcome to Solitude Cabins, where we offer the peace and serenity of mountain living combined with easy access to some of the most exciting events Colorado has to offer. 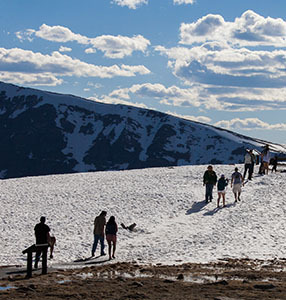 While we are surrounded by the beautiful mountain landscape of Rocky Mountain National Park, our activities aren’t limited to hiking and snowshoeing. Fishing enthusiasts, shopping experts, and music aficionados alike can all find an activity that suits their interests. 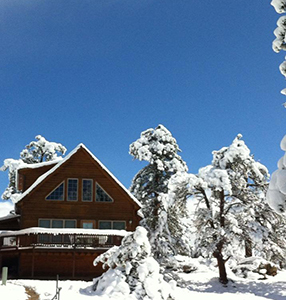 The festivals and markets change depending on the season, so there’s no going wrong when you’re visiting our Estes Park cabins. From music festivals and art walks to flea markets and waterfall hikes, spring in Estes Park is an exciting time. Watch as the lakes begin to melt and the smell of grilling wafts through the town. Outdoor temperatures usually average between 40 and 60 degrees, with nights dipping into the 30s. Enjoy the crisp, colorful Estes Park air in spring as wildflowers begin to bloom and the landscape comes alive. Summer in Estes Park attracts tourists from all over who are searching for the beauty of the Rocky Mountains. With local restaurants to visit and cultural festivals to attend, there is always something new to do. For our more adventurous guests, check out the most popular alpine climbs in Rocky Mountain National Park or spend your day whitewater rafting in the beautiful 75-degree temperatures. The annual Scottish/Irish Highland Festival attracts thousands to Estes Park. 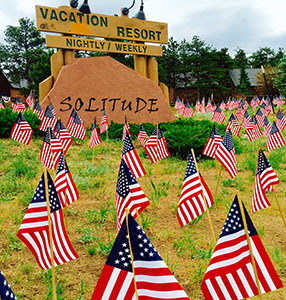 As an added bonus, Solitude Cabins is the closest Estes Park lodging to the festival! Join in the fun this autumn, or get away from it all by going on a hike through the fall foliage. Experiencing the Elk Rut, listening to the Elk Bugle, and watching the males fight for their “harem” is one of nature’s most exhilarating and unforgettable experiences. 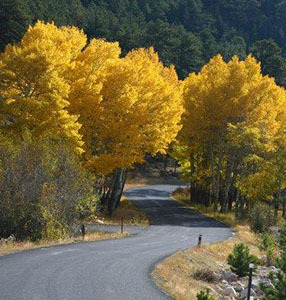 The fall signals the beginning of Estes Park returning to its small mountain village roots. Don’t miss the magic. Welcome to the season of serenity. With shorter days and whiter peaks, we enjoy hot coffee in the morning overlooking the views and snowshoeing in the afternoons. When the snow and winds start blowing in, we spend our time indoors with those we love most. Check out the family fun at the Estes Valley Community Center – new in 2018. It offers a variety of indoor activities and seniors get free entry. Contact us for your reservation today.